It’s an amazing thing. You think that you have all the time ahead of you and before you realize it, it’s gone and you find yourself in fall. A year later. I remember last fall. That fall was special. We had taken Lulu apple picking for her first time. She was only ten months old at the time, not yet walking. But already curious about everything. About the wind gently moving the leaves up in the trees; about the soft grass caressing her feet; about every bit of activity around her. About apples too. Beautiful organic red apples. 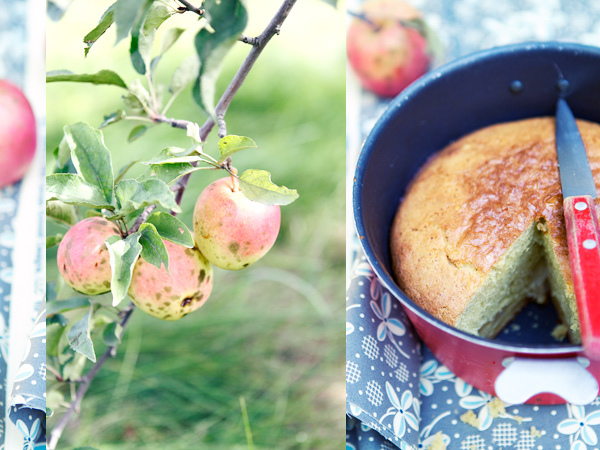 I remember that the day we went apple picking, I had baked an apple and hazelnut clafoutis to celebrate the day. Yesterday, we decided to return to the same organic farm. Because we had enjoyed our time so much. Because we wanted Lulu to share her second apple picking experience with her Irish grandma–who had kindly accompanied me at SAW so that I could teach. Lulu calls her Gang Gang. Seeing them together is the sweetest thing. Seeing them build secrets is precious. Food connections. Yesterday, as they sat in the back of the car on our way to the farm, Gang Gang sneaked a madeleine in Lulu’s small hand. “You don’t mind Béa, do you?” she said, smiling mischievously. They were happy. Laughing with their mouths full. When we arrived at the farm, it was still early so the place felt quiet. It was sunny and comfortably warm. It was surely going to be a lovely day. 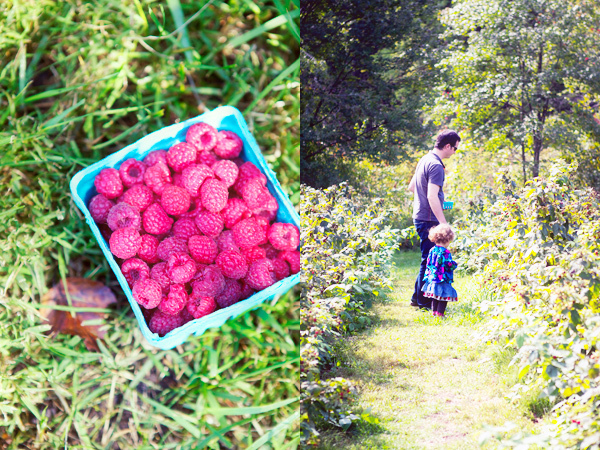 We picked apples and raspberries. Lulu was not walking. She was running up and down the narrow lanes between the raspberry bushes, carefully helping us to fill our cartons of raspberries. 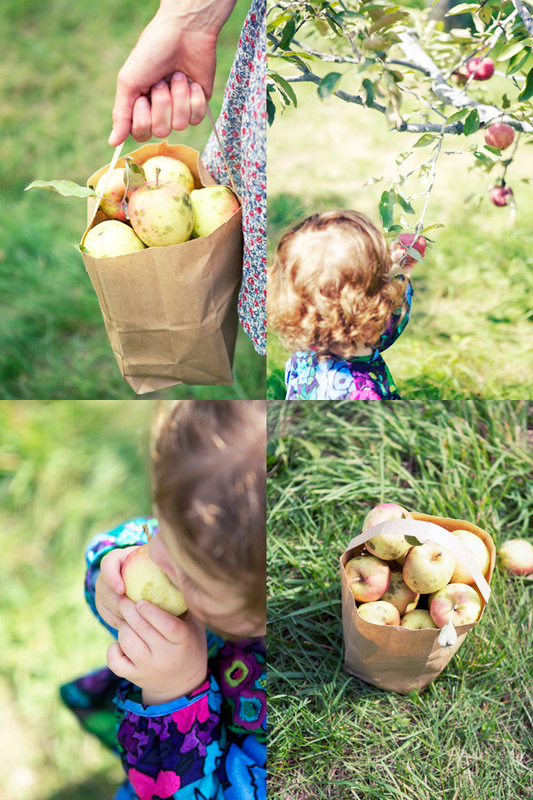 She was running from apple tree to apple tree, carrying a small bag in each hand, before handing them back to us when she thought they felt too heavy. She looked busy. Concentrated and focused. She filled the air with joy. While I filled bags with apples. Content at the thought of having had once again a lovely apple picking time. Happy to know I would be baking an apple and olive oil cake upon our return. One that tasted like early fall. And family time. 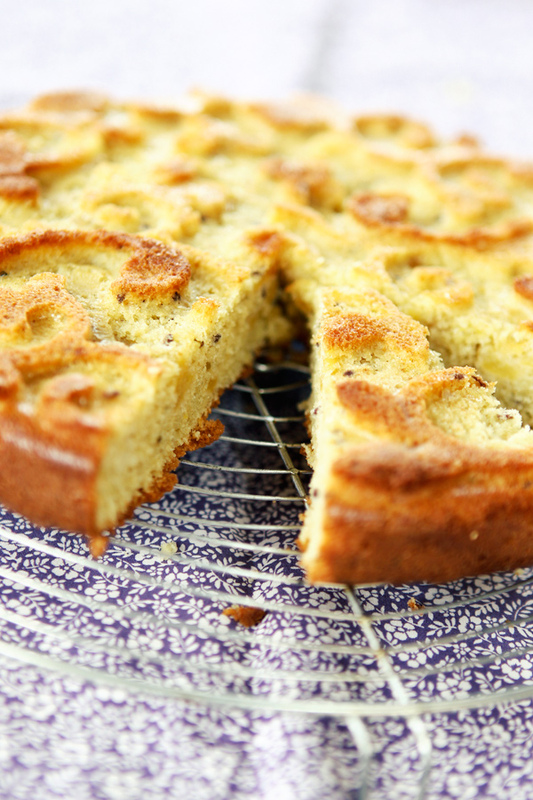 And for another idea, remember this apple and olive oil cake that I baked a while ago too. In a frying pan, heat 1 tablespoon butter over medium heat. When warm, add the diced apples with 2 tablespoons sugar, the vanilla bean and seeds and cook for 5 minutes, or until the apples are softer. Discard the vanilla bean; set aside. Preheat the oven to 350 F. Butter a 10-inch mold and set aside. In a bowl, combine the flours and baking powder and lemon thyme, if using. In another bowl, beat the eggs with the sugar and a pinch of salt. Add the olive oil and and then the flours. Fold the apples in the cake batter. Transfer the batter to the mold and bake the cake for 35 to 40 minutes, or until a sharp knife inserted in the middle comes out dry. Let the cake cool for 5 minutes before unmolding. Note: I baked this recipe the first time when I was in France four weeks ago. I then used millet, brown rice and quinoa flours combined with almond meal. I baked the cake using a whimsical patterned mold — as you can see in the second picture. Yesterday, I used a smalled and taller charlotte mold borrowed from my friend E. since I am now cooking in a small kitchen while our kitchen is being remodeled. I used all-purpose gluten free baking flour. Since the charlotte mold was smaller and less wide, I increased the cooking time to 50 to 55 minutes. It sounds absolutely earthy and delicious. I love both millet and brown rice flours in cakes. Apple and olive oil must add an amazing flavor and texture. A must try for me!! 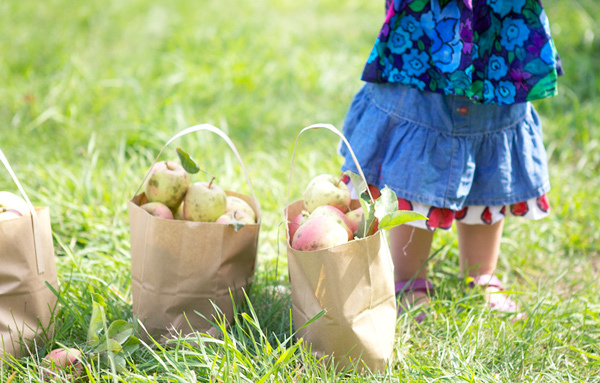 One of my favorite things about Autumn is apple picking. 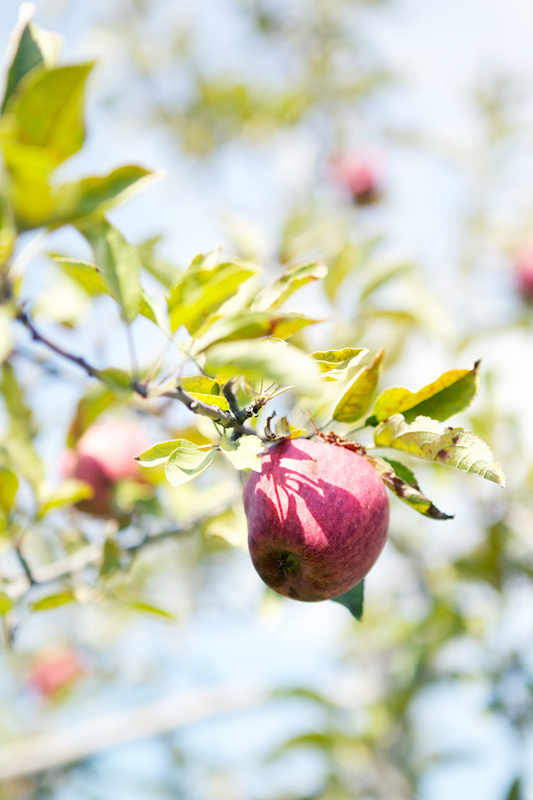 Growing up we had orchards on our farm, there is something so magical about it! This cake looks and sounds so amazing, I especially love the gluten free flours! Saving this! It felt very quiet reading hits. Could almost feel the sun. Mmmmm. Heavenly post. Autumn is my favorite time of year! Couleur d’été, couleur d’enfance, c’est délicieusement nostalgique en ce premier jour d’automne! lovely cake, j’en ferai bien un aussi … merci ! My face broke into a wide smile ;).. I simply love that picture of Lulu alone with the little brown bag.. she seems so busy.. like what you said! ahhh… what a breath of fresh air bea! 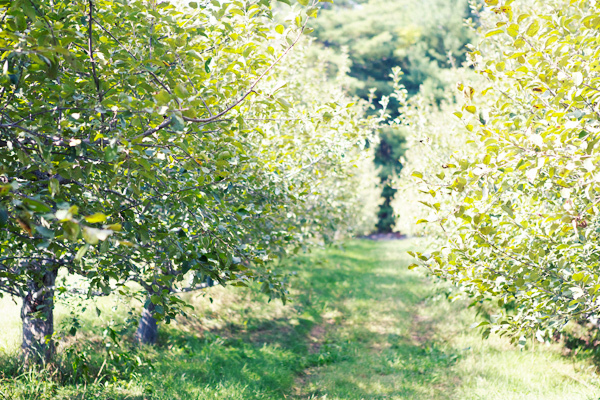 we went apple picking while we were home at my uncle’s property and there’s always something so special about it. can’t believe how big lulu is. gorgeous! Bea, This takes me back to when I picked raspberries (and apples) with my son, now in college. We used to poke 2 holes in an empty 1-quart yogurt container and insert a string to make a loop so we could hang the containers around out necks for 2-handed picking. Just yesterday he e-mailed me asking if he could come home this weekend and pick raspberries! Thanks for the link to the farm, we may be heading there soon. Happy times. And how did it taste, Bea? The apples don’t look great, but the experience, photography and writing transforms them, somehow. I just crushed all of my apples and made out first batch of “Nectar of the Gods” (homemade apple juice) and then wished I had saved some for an olive oil cake as I had just made a few zucchini ones. So, I tweeted out for apples, and now have some. Your recipe is timely. Thank you. I love baking with olive oil. I also use it in an upside down cake and cookies. I notice that others can not detect its flavor, though I can taste it — barely — because I know its there. I’m waiting for the trucks to go down our street, selling small delicious apples from the mountains in the state of Juarez. They are always a treat — a little buggy, but that’s the sign that they are unsprayed. Beautiful! I love the simple pleasure of picking your own fruits. and a wonderful (and memorable) way to mark time! how i love coming here ! The perfect way to welcome fall. 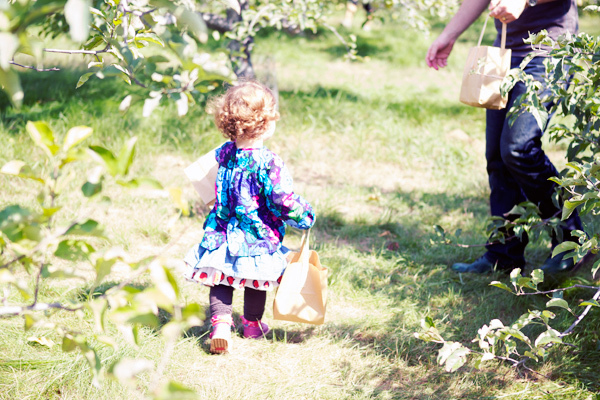 Now with children in their early 20’s – we still manage apple orchard time.The years fly by – but all those orchard afternoons stay still. The cake is perfect! Beautiful, beautiful, beautiful. I love the idea for the cake. Miam, I have a colleague who is allergic to gluten and dairy so that would be the perfect cake for her. Just as I was thinking that I am in the mood to try an olive oil cake, i passed the farmstand and sall all the autumn apples and right here you put it all in one. 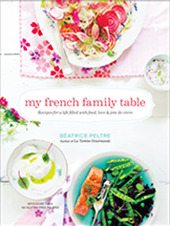 im looking forward to making this…thanks bea! So sweet! Lulu is cuter and cuter!!! Yes you can substitute these flours with 200 g wheat flour. What a beautiful post and recipe. Makes me wish I was still living in the Boston area. I never did this, I mean, to comment a recipe. But to celebrate Fall, I just made this cake, and with my orchard apples and my father in law’s olive oil, in Douro region (Portugal), I must say we just love its exquisite taste. Great way to enter my favourite season. Why do you always take pictures of your daughter from the back? Why are you afraid to show her face? Wonderfu Margarida, I am thrilled. Thanks for letting me know. Marina, I am not afraid of showing pictures of Lulu’s face. It’s just a choice I’ve made, a matter of protecting her. I love your pictures. They are so atherial and soft. Un billet qui respire la fin de l’été, superbe ! A place where we can have beautiful dreams, where we can dare dreaming……. Amazing blog. Colors that make us breath. Your daughter looks adorable…..
Wow, what a gorgeous fall day. Your photos are gorgeous – and so is this cake. I love olive oil in cakes! Thank you everyone. I cannot wait for next time. There has to be more this year! You are such a talented writer, Béa! This was a wonderful little story which really made my day. And of course I have to say a few words about the cake! I baked it today making a few adaptions (using wheat flour and almond flour instead of the gluten-free alternatives as well as rosmary instead of lemon thyme). It was a real afternoon treat. Thank you so much for your inspiration once again. marina, i thought your q was rather funny. bea, i am in awe of your ability to be so personal and romance us with your stories keeping us interested, without compromising certain privacy. you do it so gracefully. your talents are so impressive. thank you!! Can I use regular AP flour instead of gluten free for this recipe. C’est toujours un plaisir de vous lire. Merci! J’ai aussi une question – les moules à gâteaux, sont-elles disponibles en ligne? J’ai réussi à en trouver une (‘La Reine’ de Lékué). Mais l’autre, celle de Butternut/Apple cake? Pourriez-vous nous dire d’où elle vient? Merci mille fois – et pour les recettes, et pour ce blog super! C’est toujours une inspiration. Where would I find a mold like the one you used? Love it! Ce gâteau semble délicieux! J’aime bien utiliser l’huile d’olive dans les gâteaux. bea, all of your food looks delicious, and i was just craving a nice, dense fruity cake when i remembered your blog and found this recipe! unfortunatly, like most amature cooks living in america, i dont have an ingredient scale in my house, but i read online that 200 grams of flour is 2 cups, so i tried that… turned out waaay too dry. but then i added between 1/4-1/3 cup of milk to moisten it up, and it turned out really, really nice! just posting this for any other cooks who dont have a scale… also, i drizzled some maple syrup on top when it just got out of the oven- fantastic! u take amazing pictures, bea, and your daughter always has the cutest little outfits! 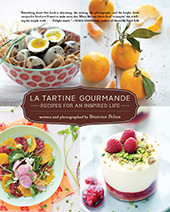 Having recently gone gluten-free, I am so grateful for all of your incredible recipes. I have a question re this one as when I first made this it was a bit dry and I baked it for only 25 min. Still super yummy, though! I’m wondering if I put in too much flour. Is it 100 g millet and 100 g brown rice or 100 g combined? Thanks! Thank you. Good for you! It is 100 g combined of flour. Is this what you did? I actually did 100g each and added a bit more oil so I will try it with the combined flours tonight. My husband and son have practically devoured the first one already. Thanks!